This article is about the song by the Beatles. For other uses, see Here Comes the Sun (disambiguation). "Here Comes the Sun" is a song written by George Harrison that was first released on the Beatles' 1969 album Abbey Road. Along with "Something" and "While My Guitar Gently Weeps", it is one of Harrison's best-known compositions from the Beatles era. The song was written at the country house of his friend Eric Clapton, where Harrison had chosen to play truant for the day, to avoid attending a meeting at the Beatles' Apple Corps organisation. The lyrics reflect the composer's relief at both the arrival of spring and the temporary respite he was experiencing from the band's business affairs. The Beatles recorded "Here Comes the Sun" at London's EMI Studios in the summer of 1969. Led by Harrison's acoustic guitar, the recording also features Moog synthesizer, which he had introduced to the Beatles' sound after acquiring an early model of the instrument in California. Reflecting the continued influence of Indian classical music on Harrison's writing, the composition includes a series of unusual time changes over the "Sun, sun, sun, here it comes" refrain. "Here Comes the Sun" has received acclaim from music critics. Combined with his other contribution to Abbey Road, "Something", it gained for Harrison the level of recognition as a songwriter that had previously been reserved for his bandmates John Lennon and Paul McCartney. Harrison played the song during many of his relatively rare live performances as a solo artist, including at the Concert for Bangladesh in 1971 and, with Paul Simon, during his appearance on Saturday Night Live in 1976. Richie Havens  and Steve Harley & Cockney Rebel each had hit singles with "Here Comes the Sun" in the 1970s. Nina Simone, George Benson, Booker T. & the M.G. 's, Peter Tosh and Joe Brown are among the many other artists who have covered the song. "Here Comes the Sun" is one of Harrison's best-known Beatles compositions alongside "Something" and "While My Guitar Gently Weeps". The early months of 1969 were a difficult period for Harrison: he had quit the band temporarily, he was arrested for marijuana possession, and he had his tonsils removed. "Here Comes the Sun" was written at the time when Apple was getting like school, where we had to go and be businessmen: 'Sign this' and 'sign that.' Anyway, it seems as if winter in England goes on forever, by the time spring comes you really deserve it. So one day I decided I was going to sag off Apple and I went over to Eric Clapton's house. The relief of not having to go see all those dopey accountants was wonderful, and I walked around the garden with one of Eric's acoustic guitars and wrote "Here Comes the Sun". As Clapton states in his autobiography, the house in question is known as Hurtwood Edge. When interviewed in the Martin Scorsese documentary George Harrison: Living in the Material World, Clapton said he believed the month was April. Data from two meteorological stations in the London area show that April 1969 set a record for sunlight hours for the 1960s. The Greenwich station recorded 189 hours for April, a high that was not beaten until 1984. The Greenwich data also show that February and March were much colder than the norm for the 1960s, which would account for Harrison's reference to a "long, cold, lonely winter". The song is in the key of A major. The main refrain uses a IV (D chord) to V-of-V (B chord) progression (the reverse of that used in "Eight Days a Week" and "Sgt. Pepper's Lonely Hearts Club Band"). The melody in the verse and refrain basically follows the pentatonic scale from E up to C♯ (scale steps 5, 6, 1, 2, 3). One feature is the increasing syncopation in the vocal parts. Another feature is the guitar flat-picking that embellishes the E7 (V7) chord from 2:03 to 2:11, creating tension for resolution on the tonic A chord at "Little darlin' ". The bridge involves a ♭III-♭VII-IV-I-V7 triple descending 4th (or Tri-Plagal) progression (with an extra V7) as the vocals move from "Sun" (♭III or C chord) to "sun" (♭VII or G chord) to "sun" (IV or D chord) to "comes" (I or A chord) and the additional 4th descent to a V7 (E7) chord. The lyric here ("Sun, sun, sun, here it comes") has been described as taking "on the quality of a meditator's mantra". The song also features extreme 4/4 (in the verse) and a sequence of 11/8 + 4/4 + 7/8 (which can also be transcribed as 11/8 + 15/8) in the bridge, phrasing interludes which Harrison drew from Indian music influences. In the second verse (0:59–1:13) the Moog synthesizer doubles the solo guitar line and in the third verse the Moog adds an obbligato line an octave above. The last four bars (2:54–3:04) juxtapose the guitar break with a repeat of the bridge. Harrison, Paul McCartney and Ringo Starr recorded the rhythm track in 13 takes on 7 July 1969. John Lennon did not contribute to the song as he was recovering from a car crash. Towards the end of the session Harrison spent an hour re-recording his acoustic guitar part. He capoed his guitar on the 7th fret, resulting in the final key of A major (in fact, slightly above A major due to the track being varispeeded by less than a semitone). He also used the same technique on his 1965 song "If I Needed Someone", which shares a similar melodic pattern. The following day he taped his lead vocals, and he and McCartney recorded their backing vocals twice to give a fuller sound. A harmonium and handclaps were added on 16 July. Harrison added an electric guitar run through a Leslie speaker on 6 August, and the orchestral parts (George Martin's score for two piccolos, two flutes, two alto flutes and two clarinets) were added on 15 August. "Here Comes the Sun" was completed four days later with the addition of Harrison's Moog synthesizer part. The master tapes reveal that Harrison recorded a guitar solo that was not included in the final mix at that time. Abbey Road was released on 26 September 1969 with "Here Comes the Sun" sequenced as the opening track on side two of the LP. Along with "Something", which was issued as a single from the album, the song established Harrison as a composer to match Lennon and McCartney. According to author Alan Clayson, Harrison's two Abbey Road compositions received "the most widespread syndication" of all the tracks on the album, partly through the number of cover versions they attracted. In Japan, "Here Comes the Sun" was also issued on a single in 1970, as the B-side to McCartney's Abbey Road track "Oh! Darling". While the Beatles never released the track on a single in Britain, new rules implemented to the UK Singles Chart in 2007 allowed any song to enter the charts based on download sales. This allowed several songs recorded by the Beatles to list on the charts when the group's back catalogue became available for download on iTunes in 2010, including "Here Comes the Sun", which peaked at number 58 on 27 November that year. Writing for Rolling Stone in 2002, Mikal Gilmore likened "Here Comes the Sun" to the McCartney-written "Let It Be" and Lennon's "Imagine", as Harrison's "graceful anthem of hope amid difficult realities". While expressing regret at having underestimated Harrison as a songwriter, Martin described "Here Comes the Sun" as being "in some ways one of the best songs ever written". The track has appeared in many critics' lists of the Beatles' best recordings. Among these, the NME placed it at number 4 in the magazine's 2015 list of "the 100 Greatest Beatles Songs". In a similar poll compiled by Mojo in 2006, where the song appeared at number 21, Danny Eccleston described it as "perhaps the best song – outside 'Jerusalem' – that religion can claim credit for", adding: "Those who professed surprise at Harrison's immediate elevation to Most Successful Solo Beatle status [in 1970] clearly weren't listening to this." "Here Comes the Sun" appeared at number 28 on Rolling Stone's 2010 list, where the editors commented: "Along with 'Something,' it gave notice that the Beatles now had three formidable composers." "Here Comes the Sun" was played as the entrance music for Ivanka Trump at the 2016 Republican National Convention. The George Harrison estate complained about the song being used to support Donald Trump's presidential campaign, saying it was "offensive and against the wishes of the George Harrison estate". The Harrison family later tweeted: "If it had been Beware of Darkness, then we MAY have approved it! #TrumpYourself." In 1977, astronomer and science populariser Carl Sagan attempted to have "Here Comes the Sun" included on a disc of music accompanying the Voyager space mission. Titled the Voyager Golden Record, copies of the disc were put on board both spacecraft in the Voyager program in order to provide any entity that recovered them with a representative sample of human civilization. Writing in his book Murmurs of Earth, Sagan recalls that the Beatles favoured the idea, but "[they] did not own the copyright, and the legal status of the piece seemed too murky to risk." When the probes were launched in 1977, the song was not included. Nine years later, Harrison recorded "Here Comes the Moon". It was included as a track on his 1979 eponymous album. (1976) "Here Comes the Sun"
(1976) "(I Believe) Love's a Prima Donna"
In 1976, "Here Comes the Sun" was covered by British rock band Steve Harley & Cockney Rebel, and released as the lead single from the band's fifth studio album Love's a Prima Donna. 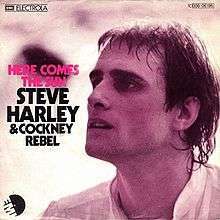 "Here Comes the Sun" was the first cover version that Steve Harley and Cockney Rebel had chosen to record. It would be the band's last Top 40 single. In August 1971, Harrison performed the song at the Concert for Bangladesh, accompanied by Pete Ham of the group Badfinger. He also played it during his appearance on Saturday Night Live in November 1976, as a duet with Paul Simon. A live version from his 1991 Japanese tour with Eric Clapton appears on Harrison's Live in Japan double album. Booker T. & the M.G. 's included the song on their 1970 Abbey Road tribute album, McLemore Avenue. That same year, "Here Comes the Sun" was covered by Peter Tosh and released as a single, although it was not widely available until its inclusion on Can't Blame the Youth in 2004. American folk singer Richie Havens had a US hit with his 1971 version, which peaked at number 16 on the Billboard Hot 100 chart. On their 1994 debut album, Who Is, This Is?, ska-punk band Voodoo Glow Skulls recorded a version of the song. We Five released a version on their 1970 album Catch the Wind. Nina Simone recorded "Here Comes the Sun" as the title track to her 1971 covers album. Linda Eder released a version of "Here Comes the Sun" in 2002 on her Gold album. On 29 November that year, Joe Brown performed the song at the Concert for George tribute, which was organised by Clapton and held at the Royal Albert Hall in London. Brown's performance was included on the subsequent live album from the event and in David Leland's concert film. Naya Rivera and Demi Lovato performed the song, as Santana Lopez and Dani respectively, in Glee's fifth season episode "Tina in the Sky with Diamonds". Their duet version appears on the album Glee Sings the Beatles. Writing for MTV, Jocelyn Vena commented that the two singers sang "in perfect harmony over a plucky guitar." Idolator also pointed out "their beautiful harmonies" as highlight. Swedish heavy metal band Ghost released a version of the song as a bonus track on the Japanese edition of their 2010 album Opus Eponymous. In 1980, on their album Flaming Schoolgirls, the Runaways recorded "Here Comes the Sun". Malaysian singer Yuna recorded her version for the 2012 film Savages. It can be heard in the ending credits. Dave Edmunds, Debbie Gibson and Raffi sang a live cover version in a Japanese television special aired in 1990. Sandy Farina covered "Here Comes the Sun" on the Martin-produced soundtrack to the 1978 film Sgt. Pepper's Lonely Hearts Club Band. Sheryl Crow sang it for Bee Movie in 2007. The Punkles covered this song on their 2006 album "For Sale!". ↑ "Richie Havens: Roots, Freedom, Bob Dylan & The Beatles!". The Immortal Jukebox. 2016-03-09. Retrieved 2016-10-03. ↑ Harrison 2002, p. 144. ↑ Rowley, David. All Together Now, the ABC of the Beatles songs and albums. Troubador, 2013. 1 2 3 Pollack, Alan. "Notes on 'Here Comes the Sun'". Retrieved 14 February 2012. 1 2 3 4 5 Everett 1999, p. 258. ↑ Pedler 2003, p. 10. ↑ Pedler 2003, pp. 249–50. ↑ Everett 1999, p. 257. ↑ Pedler 2003, p. 555. ↑ Lewisohn 2005, p. 178. 1 2 MacDonald 2005, p. 356. ↑ Miles 2001, p. 347. ↑ Lewisohn 2005, p. 180. ↑ Lewisohn 2005, p. 190. ↑ "The Beatles 'Here Comes The Sun': Lost Solo Discovered". andpop.com. 2012. Retrieved 28 January 2012. ↑ Michaels, Sean (28 March 2012). "New George Harrison guitar solo uncovered". The Guardian. Archived from the original on 23 February 2014. Retrieved 5 February 2014. ↑ Castleman & Podrazik 1976, p. 81. ↑ Hertsgaard 1996, pp. 297, 300. ↑ Woffinden 1981, p. 26. ↑ Miles 2001, pp. 355–56. ↑ Clayson 2003, p. 285. 1 2 3 Womack 2009, p. 385. ↑ The Editors of Rolling Stone 2002, pp. 38–39. ↑ Hertsgaard 1996, pp. 299–300. ↑ "The Beatles 'Here Comes the Sun'". Acclaimed Music. Retrieved 28 September 2015. ↑ Alexander, Phil; et al. (July 2006). "The 101 Greatest Beatles Songs". Mojo. p. 90. ↑ "100 Greatest Beatles Songs: 28. 'Here Comes the Sun'". rollingstone.com. Retrieved 28 September 2015. ↑ Owen, Paul; Bixby, Scott (23 July 2016). "'The greatest asset Trump has': Ivanka gets rave reviews for Cleveland speech". The Guardian. Retrieved 23 July 2016. ↑ DeVille, Chris (22 July 2016). "George Harrison Estate Addresses RNC's Use Of 'Here Comes The Sun' To Introduce Ivanka Trump". Stereogum. Retrieved 23 July 2016. ↑ Fontenot, Robert. "The Beatles Songs: 'Here Comes the Sun' – The history of this classic Beatles song". oldies.about.com. Retrieved 10 March 2016. ↑ Sagan et al. 1978. ↑ "Steve Harley & Cockney Rebel - Love's A Prima Donna at Discogs". Discogs.com. Retrieved 2012-12-06. 1 2 "STEVE HARLEY & COCKNEY REBEL | full Official Chart History | Official Charts Company". Officialcharts.com. Retrieved 2016-10-03. ↑ Stewart, Tony (24 April 1976). "Harley blows big chance". New Musical Express. ↑ "The Irish Charts - All there is to know". Irishcharts.ie. Archived from the original on 3 June 2009. Retrieved 2016-10-03. ↑ Schaffner 1978, p. 147. ↑ Lavezzoli 2006, p. 192. ↑ Clayson 2003, p. 361. ↑ Jurek, Thom. "Booker T. & the MG's McLemore Avenue". AllMusic. Retrieved 29 September 2015. ↑ "Richie Havens – Chart history". Billboard charts. Retrieved 23 April 2013. ↑ "Voodoo Glow Skulls, "Who Is, This Is?"". AllMusic. Retrieved 27 July 2013. ↑ "We Five, Catch the Wind". AllMusic. Retrieved 29 February 2012. ↑ "Here Comes the Sun – Nina Simone". AllMusic. Retrieved 24 February 2012. ↑ Kanis, Jon (December 2012). "I'll See You in My Dreams: Looking Back at the Concert for George". San Diego Troubadour. Retrieved 29 September 2015. ↑ Leng 2006, p. 309. ↑ Inglis 2010, p. 155. ↑ Ruhlmann, William. "Various Artists A Concert for George [Video]". AllMusic. Retrieved 29 September 2015. ↑ Vena, Jocelyn (18 September 2013). "Demi Lovato, Naya Rivera Harmonize On 'Glee' Duet". MTV. Retrieved 20 September 2013. ↑ Gracie, Bianca (18 September 2013). "Demi Lovato & Naya Rivera Cover The Beatles' 'Here Comes The Sun': Hear The 'Glee' Track". Idolator. Retrieved 20 September 2013. ↑ "Earth '90: Children and the Environment B.A.M. Majestic Theater Brooklyn, NY Jun 2, 1990):". concertvault.com. Retrieved 22 November 2014. Clayson, Alan (2003). George Harrison. London: Sanctuary. ISBN 1-86074-489-3. The Editors of Rolling Stone (2002). Harrison. New York, NY: Rolling Stone Press. ISBN 978-0-7432-3581-5. "Here Comes the Sun". Fretbase.com. 2010. Archived from the original on 24 December 2009. Retrieved 7 January 2010. Harrison, George (2002) . I, Me, Mine. San Francisco, CA: Chronicle Books. ISBN 978-0-8118-5900-4. Inglis, Ian (2010). The Words and Music of George Harrison. Santa Barbara, CA: Praeger. ISBN 978-0-313-37532-3. Lavezzoli, Peter (2006). The Dawn of Indian Music in the West. New York, NY: Continuum. ISBN 0-8264-2819-3. Leng, Simon (2006). While My Guitar Gently Weeps: The Music of George Harrison. Milwaukee, WI: Hal Leonard. ISBN 978-1-4234-0609-9. Pedler, Dominic (2003). The Songwriting Secrets of the Beatles. London: Omnibus Press. ISBN 978-0-7119-8167-6. Womack, Kenneth (2014). The Beatles Encyclopedia: Everything Fab Four. Santa Barbara, CA: ABC-CLIO. ISBN 978-0-3133-9171-2. "Make Me Smile (Come Up and See Me)"
"Mr. Raffles (Man, It Was Mean)"
"(I Believe) Love's a Prima Donna"
"The Best Years of Our Lives (live)"
"I Can't Even Touch You"
"Star for a Week (Dino)"
"For Sale. Baby Shoes. Never Worn"